JPEGmini Pro is a powerful yet simple tool, trusted by tens of thousands of photographers worldwide who have JPEGmini fully integrated into their workflow. It reduces your image file size by up to 80% without compromising on quality. JPEGmini Pro utilizes all the CPU cores in your computer simultaneously, crunching your photos at amazingly high speeds, minimizing your work time. We’ve also added support for photos up to 50 Megapixels, covering all your photography needs including the highest resolution cameras, panorama shots and collages. 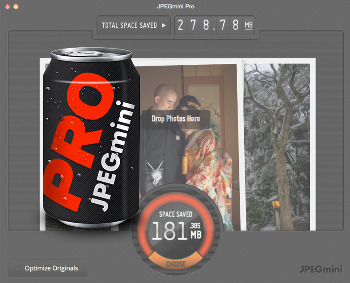 JPEGmini Pro includes a plug-in for Adobe® Lightroom® so you won’t have to change the way you work. Now, when you export your photos directly from Lightroom, they will be automatically optimized by JPEGmini to the lowest file size possible without ever sacrificing quality. What are the differences between JPEGmini Pro and the regular JPEGmini app?